“My Life as an Over-comer,” from Christian Faith Publishing author Rose Gordon, is an intriguing true story of one woman's struggle to find God's path. “My Life as an Over-comer”: a phenomenal account of a life lived for God, filled with wonder and joy. 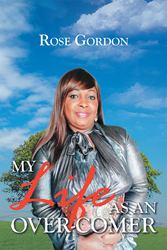 “My Life as an Over-comer” is the creation of published author, Rose Gordon, who was born in Kingston, Jamaica, and went through many struggles in her life. A single mother that raised three children on her own discovered that there is more to life when it’s lived for God. Her testimony of how Jesus delivered her from depression, sicknesses, oppression, and loneliness, led her to share her story to others who are experiencing similar tests. Rose Gordon is a pastor, a prophetess, and a spiritual life coach. She wants both women and men from all over the world, single or married, with children or without children, to experience God for themselves because he is real. There’s no limit to what the Lord can do in the lives of many who trust and believe in him. Rose Gordon is a living testimony. All the trials and temptations she has faced and overcome has molded her and shaped her into the woman that God wants her to be. Rose Gordon is an “overcomer,” and she is also more than a conqueror. Up until this day, God continues to empower her to be all that he wants her to be in life. Rose believes that “'My Life as an Overcomer' will uplift your spirit and change your perspective about your current situation. No need to doubt or fear for the Lord is our strength in the times of trouble. 'My Life as an Overcomer' will inspire you to follow your dreams and keep your faith in God no matter what the enemy may throw your way”. Published by Christian Faith Publishing, Rose Gordon’s new book shares a story about a woman who never gave up when it seemed like the seams were beginning to unravel. With God’s help, she was able to stay strong and persevere through the hardships. View a synopsis of “My Life as an Over-comer” on YouTube. Consumers can purchase“My Life as an Over-comer” at traditional brick & mortar bookstores, or online at Amazon.com, Apple iTunes store, Kobo or Barnes and Noble. For additional information or inquiries about “My Life as an Over-comer”, contact the Christian Faith Publishing media department at 866-554-0919.